A 2016 Readers' Favorite Bronze Award Winner and a 2017 Eric Hoffer Award Finalist, Scout's Honor asks...Who owns the rights to your honor when its been taken from you? This is a story of a self, losta self, loathedand a self, rediscovered. In Haddleboro, North Carolina, Scout Webb is a fourteen year old kind, spirited small town southern girl and a tomboy much like her namesake, the young narrator from her mothers favorite book. With both her name and her Christian faith deeply woven into the fabric of her identity, Scout always felt like she had a lot to live up to she was the kind of girl who made her parents proud. Its August 1983, and Scout is playing on a summer baseball team with Charlie Porter, her best friend since kindergarten. More than anything, she is looking forward to her last few weeks at Camp Judah, a Christian camp near the Catawba River. She cant wait to see her big crush Brother Doug, the thirty-two year old camp lifeguard who has watched her grow up each summer since she was seven years old. But after a fateful few days and one catastrophic event during her last day at the camp, Scout will be changed forever. This is a story of a self, losta self, loathedand a self, rediscovered. With the advent of the #MeToo movement, the relevance of Scout's Honor and the story inside is profound. It explores the impact of one sexually abusive encounter and manipulation of a young teen girl in the 1980s and its affect on her life, long term. 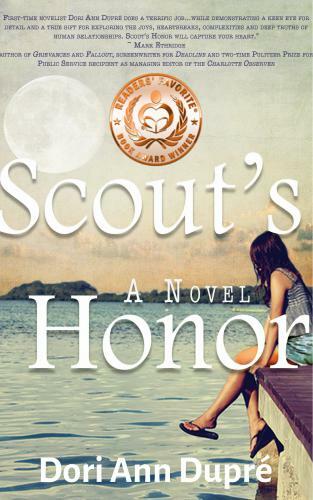 Scout's Honor is a 2016 Readers' Favorite International Award Winner for Southern Fiction and a 2017 Eric Hoffer Award Finalist.